October 2015 • SMT Magazine 29 Reducing PRint cycle time throughput should be evaluated closely above 10 prints/wipe. 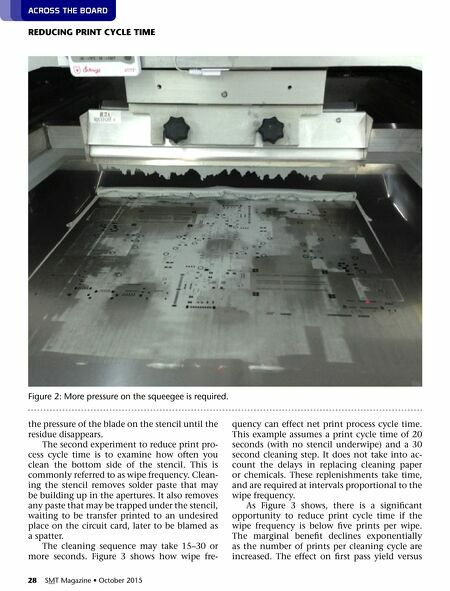 In conclusion, if the printing cycle time is the rate determining step in the SMT process, increasing the squeegee speed and pressure as well as reducing the frequency of stencil cleaning may be eas- ily tested methods of increasing the num- ber of quality circuits produced per unit time. Smt across the board mitch Holtzer is global director of customer technical service for Alpha. To contact Holtzer, click here. lourenco nampo is the South America Manager of Customer Technical Service (CTS) for Alpha, where he manages the CTS activities from Amazon to Tierra del Fuego. To contact Nampo, click here. Researchers of the MESA+ Institute for Nan- otechnology and the CTIT Institute for ICT Re- search at the University of Twente in The Neth- erlands have demonstrated working electronic circuits that have been produced in a radically new way, using methods that resemble Dar- winian evolution. The size of these circuits is comparable to the size of their conventional counterparts, but they are much closer to natu- ral networks like the human brain. The findings promise a new generation of powerful, energy- efficient electronics, and have been published in the leading British journal Nature Nanotech- nology. 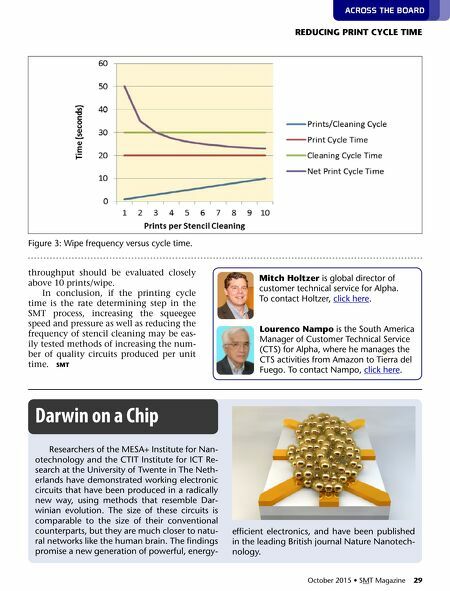 Darwin on a Chip Figure 3: Wipe frequency versus cycle time.